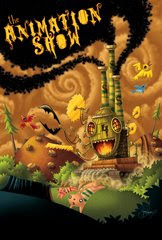 The Animation Show is a traveling film festival of animated shorts, programmed and distributed by the artists who make them. The collection is curated by Mike Judge (Beavis and Butthead, King of the Hill) and Don Hertzfeldt (Everything will be OK). The Oxford Film Festival is pleased to present the Animation Show 4 -- perhaps you saw No. 3 at our 2007 Film Festival? This collection is not rated -- and is not for kids! Bill Plympton, Gobelins, Satoshi Tomioka, Dave Carter, and more! Click here for more info about the films.